Sometimes unplanned days out are the best. Daddy had to visit Granny in hospital, but children aren’t allowed, and I fancied a daytrip to finish off the school holidays since we’d been housebound with weather for so long. So we improvised. We packed the kids up with the intention that I would amuse them in Dublin City Centre for a couple of hours while the visit took place. Then we found out that Auntie Grá had an unexpected day off work so she could meet us, this opened the possibilities. We could now let boys roam on foot and the adult child ratio was much more favourable. I fancied bringing them to the Natural History Museum, but had a backup plan of feeding them St Stephen’s Green Shopping Centre if the weather was bad or the boys weren’t enjoying the museum. We got dropped at Merrion Square and Auntie Grá arrived within minutes. I had packed sandwiches for the boys, and a few ginger oatcakes. 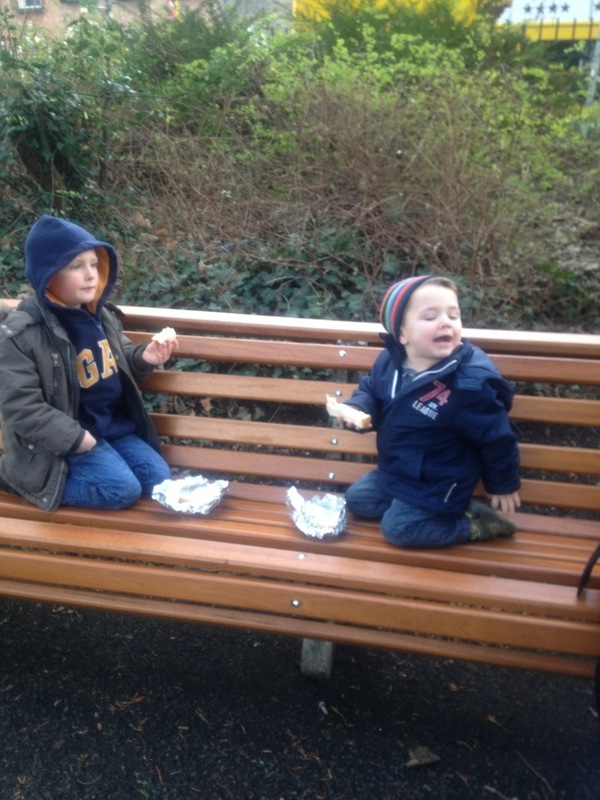 They spied them in the bag and were excited about a picnic so they chose a bench in Merrion Square Park and devoured their lunch, like true culchies chewing ham sandwiches from tinfoil parcels. We finished up our culchie feast and crossed the road to the Museum, leaving the buggy at the door and strapping Miss Laoise into her Ergo carrier. The boys bounced from exhibit to exhibit, Ciarán showing off his newly acquired reading skills, Cathal pulling Auntie Grá from one end of the room to the other. Downstairs we found Irish animals, learned that foxes eat frogs and small birds, counted the points on starfish, saw moths, examined fossils and wondered if there was a dinosaur anywhere like Peppa and George saw at the museum. Our favourite downstairs exhibit was the wolf, and it was interactive too, extra boy bonus points for that. The wolf, don’t miss it, downstairs in the Irish section, hidden in a press. We headed upstairs to what the boys called “the Zoo animals”. We were greeted at the top of the stairs by a herd of kangaroos of varying sizes. There seemed to be an abundance of zebras and many animals that we had never heard of. An angry looking hippo held court next to an elephant and a giraffe. There were glass cases full of big cats. Ciarán read where each animal was from, and started his own mini tour guide group with three little girls who started following him from exhibit to exhibit since he could read the signs. They loved it. We didn’t venture upstairs to the galleries, and after the obligatory toilet stop, not least to wash the arsenic off our hands (honestly, a staff member recommended it as some of the exhibits can contain traces of arsenic) we departed. The visiting time for any attraction is severely curtailed with young children, and in order to make things run smoothly it’s a parent’s prerogative to read their children’s cues and leave the venue no less than thirty seconds before the boredness of a three year old turns into a meltdown. Having established by asking staff members that there were no dinosaurs, I mentioned to the boys that there was an art gallery nearby. Apparently Peppa has been to one so they wanted to go too. However much people would believe that I brought my wild lively small men to the museum, I couldn’t pass up the opportunity to get them in the door of the National Gallery, mostly so that I could tell people that I did. My bad. We walked around the corner to the National Gallery, pointing out the back of Leinster House, and trying to explain what a government is to a five year old. First things first, they loved the lift. We went upstairs in said lift and Cathal expressed disappointment that they were all grown up people’s pictures and not children’s ones. He might have a point there, I ought to email the gallery. All in all I’d estimate that we spent about fifteen minutes looking at pictures, Laoise still looking all around her from her sling. I knew before we got there that the visit would be a flying one as the boys were tired and I didn’t want to expect too much of them, but I was disappointed to only learn about the gallery’s creative space for children afterwards. I thought that perhaps that staff on the desk who were very friendly and nice to the kids on our way in could have mentioned it. We’ll definitely go back to try this out as these boys are big “make and do” fans. I’m not especially well educated in art, but I do enjoy visiting galleries as a tourist and had been to the National Gallery a few times before (I’ve been to the Louvre more often! ), this was my favourite visit to a gallery ever. To hear a five year old comment on the paintings, never having seen anything like them before brought a sense of magic and wonder. He looked at the portraits of ladies in old fashioned clothes and long skirts and asked why there were so many of princesses. He pondered this Jack B. Yeats painting and decreed that he could have done a lot better, that it was very messy. So I read the description on the wall and we played a great guessing game trying to pick out shapes from the picture. His favourite was this one by William Scott entitled “Frying Pan, Eggs and Napkin”, but he thought that the name was silly as there are lemons and blueberries in the picture too. In truth Cathal was bored. He’s only three and is a doer. So we had a quick look in the sculpture room, Ciarán delighting in the “statue men showing off their willies”, and we departed the exhibition space, to the relief I’m sure of serious art appreciaters. We rounded off the gallery visit with a hot chocolate in the lovely café space, and on leaving picked up these cool stickers and some colouring packs from the reception desk. I’ll definitely bring the boys back on a more planned visit to the National Gallery with time to spend in the creative space, and looking at some more artwork. And in case you’re thinking it I’ll say it, I’d never have thought to bring boys aged five and three to a museum and an art gallery and for us all to have such a good day out. Ciarán (5) got so much out of everything and really took a lot from the learning and the new experience. I’d highly recommend short visits to both, just know your child’s limits and attenion span. And promise hot chocolate at the end. Moments after I took this photo Ciarán was apprehended by a security guard for running! Both the Natural History Museum and the National Gallery have free admission. They are walking distance from each other and (expensive) meter parking is available on Merrion Square, close to both. art, days out, dublin, national gallery, natural history museum, rainy day activities, things to do with kids. Bookmark.